Check Point® Software Technologies Ltd., a leading provider of cyber security solutions globally, announced its Check Point CloudGuard Dome9 in the Philippines, a cloud service that allows for safer and more manageable cloud deployments for enterprises. 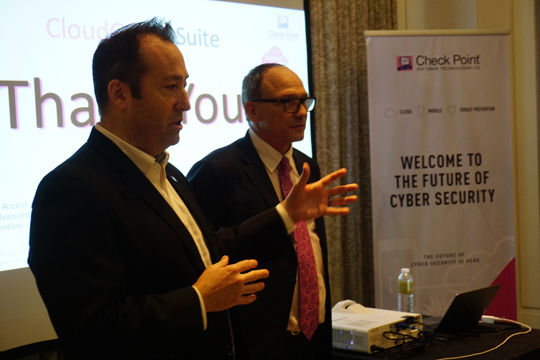 Check Point’s Evan Dumas, Regional Director for Southeast Asia (left) and Grant Asplund, Cloud Evangelist (right) discuss the benefits of CloudGuard Dome9 to help enterprises do more while remaining secure. “Fifth generation cyber-attacks are increasingly targeted enterprise cloud environments, and cyber security solution must effectively protect this vector. The addition of CloudGuard Dome9 to Check Point’s total protection architecture, will enhance our ability to deliver the benefits of Cloud with the critical security that must extend from the networks, endpoints and data centres to the Cloud and Mobile enterprise-wide,” said Zohar Alon, head of cloud product line, Check Point Software Technologies.